Most of you know about Michael's planner deal going on right now. 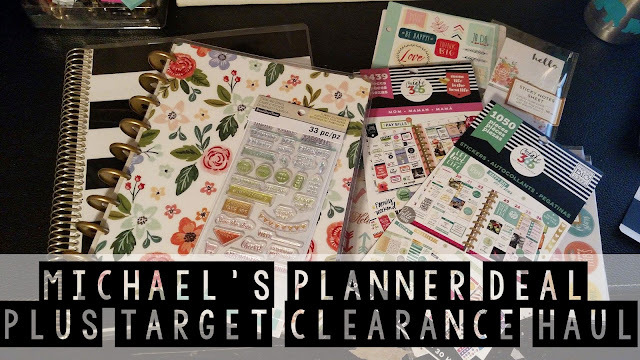 If not, they have ALL yes I mean ALL the planners and planner accessories 60% off. As if that wasn't enough there's also a sweet 20% off coupon floating around too! Making the total off 80%! I just couldn't miss out any longer. I woke up bright and early to be sure to get there before everything was gone. Thanks to a mistake my store made they had items marked 30 off instead which they fixed. It also meant more stuff was left for me! Watch the video to see my haul, Which includes a few other deals out there too! Don't forget to check you Michael's email to receive the limited edition free sticker sheet at checkout!